Location was fantastic! Easy walk to all of the facilities in Chamonix. Great size apartment for the price, much better than other ski apartments I have stayed in at more or less the same cost. LOTS of storage space in the apartment and nice to have a proper oven also rather than just a hob. Overall, a very good value stay. Most was good. Useful balcony. Decent kitchen and 2 bathrooms plus. L'appartement est assez grand et la vue sur le Mont Blanc est super! Très bien situé près de tout. La situation géographique de l'appartement était idéale pour des voyageurs qui utilisaient les transports collectifs et pour des randonneurs. Месторасположение оптимальное, тихо, но практически самый центр. Подземная стоянка - это супер. Шкафчик для хранения лыж - это просто шкафчик, без сушки, что бессмысленно. Lock in a great price for Appartment Rubis Aiguille du Midi Chamonix Centre – rated 8.1 by recent guests! 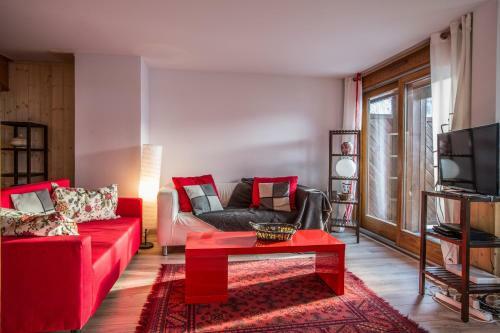 One of our top picks in Chamonix.Located in the city center of Chamonix, Appartement Rubis is a self-cateing accomodation with a terrace and free WiFi. The ski slopes are 0.9 mi away. Offering views of the Mont-Blanc Mountain, the apartment features a seating area, a flat-screen TV and a bathroom with a bath or shower. 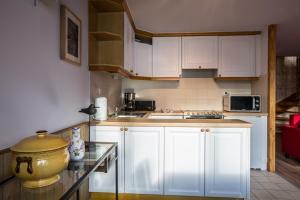 The fully equipped kitchen includes a refrigerator, an oven and a microwave. Additional facilities include a washing machine and a DVD player. Activities in the surrounding area include skiing, cycling and hiking. The property is at the foot of L'Aiguille du Midi ski elevator. Appartement Rubis is a 6-minute drive from Chamonix train station. 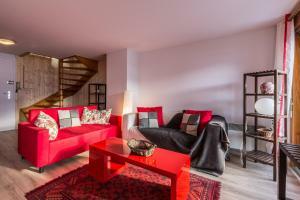 When would you like to stay at Appartment Rubis Aiguille du Midi Chamonix Centre? This apartment offers a terrace and a mountain view. It features a seating area, a flat-screen TV and a bathroom with a bath or shower. The fully equipped kitchen includes a refrigerator, an oven and a microwave. 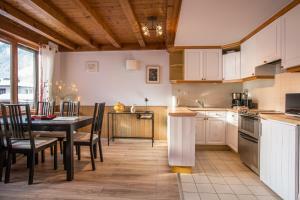 A newly renovated duplex apartment, right in the heart of Chamonix. 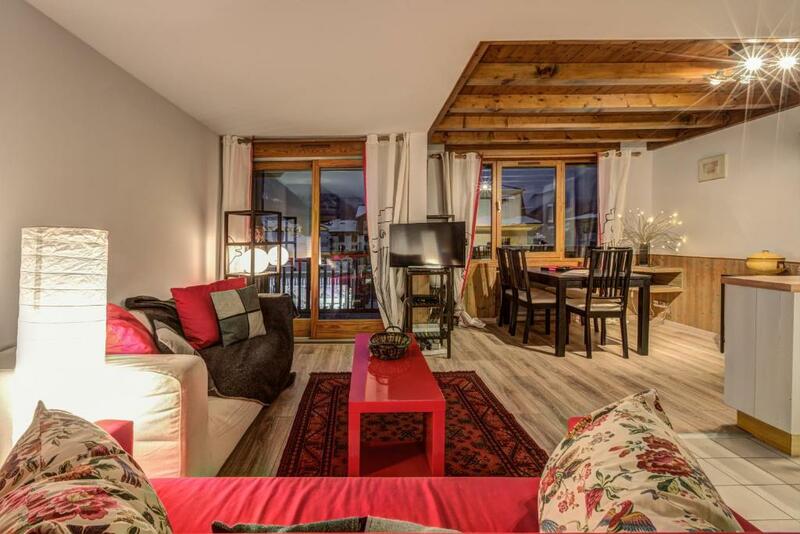 Located within close proximity to the Aiguille du Midi lift station and Chamonix town center you are within easy walking distance all the shops, restaurants, supermarkets and nightlife. 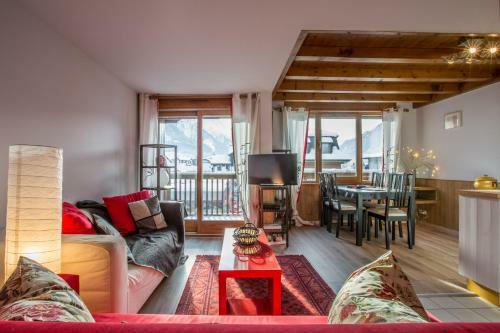 This apartment boasts views in 2 directions, relax and take in Mont Blanc from the comfortable balcony, or look out over the stunning Aiguilles Rouges. It easily sleeps 4 guests with 2 bedrooms and 2 bathrooms all with plenty of space, natural light and cosy furnishings. 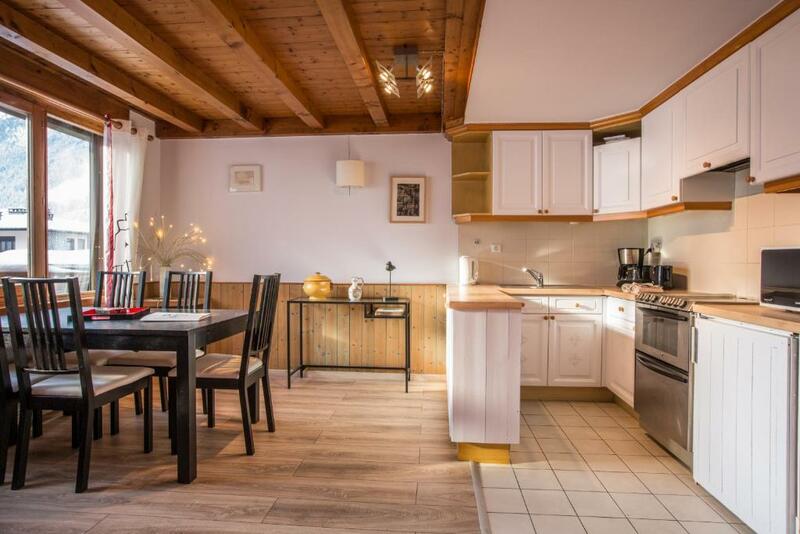 A fully fitted kitchen and open plan living area with wifi and private underground parking Rubis makes a great nest to settle into for your stay in Chamonix Mont Blanc. Property Management of chalets and apartments throughout the Chamonix Valley in winter & summer, as well as booking and managing bespoke Holiday Rentals in Chamonix properties all year round, so property owners can maximize the potential of their property investment in Chamonix. 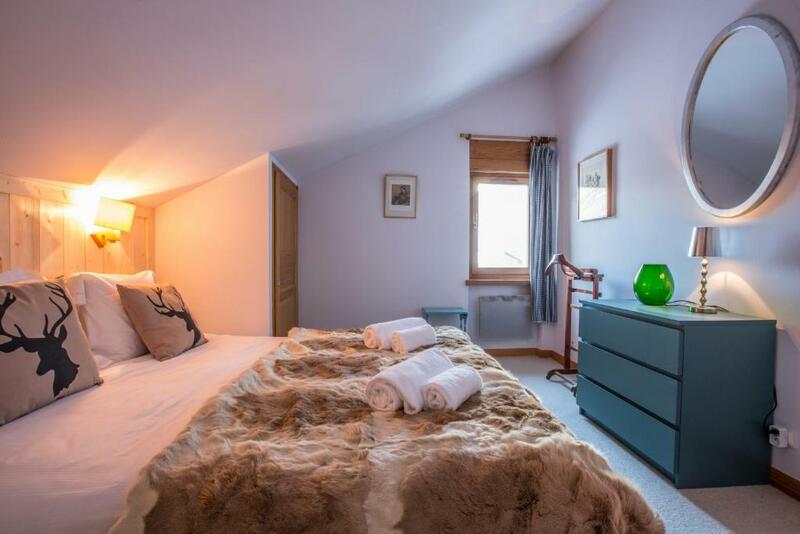 Éhvoé also offers Properties for sale for those wishing to invest in property in the Chamonix Valley and luxury Concierge Services for all their clients during their stays in Chamonix. 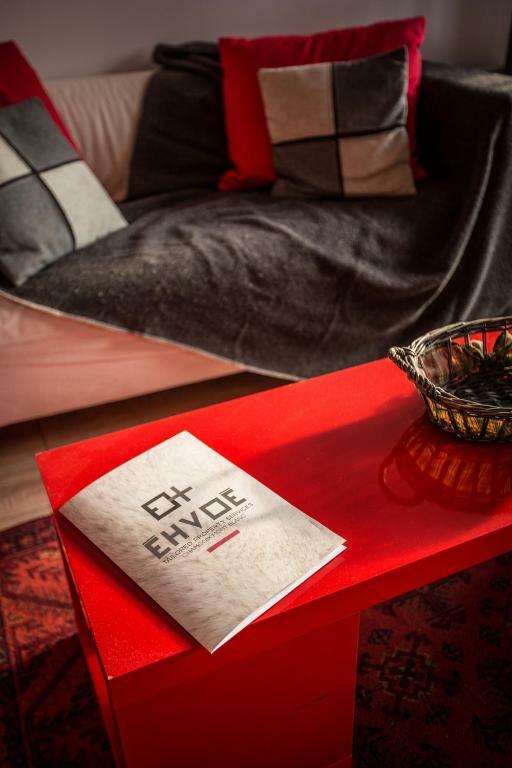 Emilie and Cyril created the company Éhvoé after working in property management in Chamonix for several years, because they wanted to offer tailored property services and share their love of the Chamonix lifestyle and environment with their clientele. 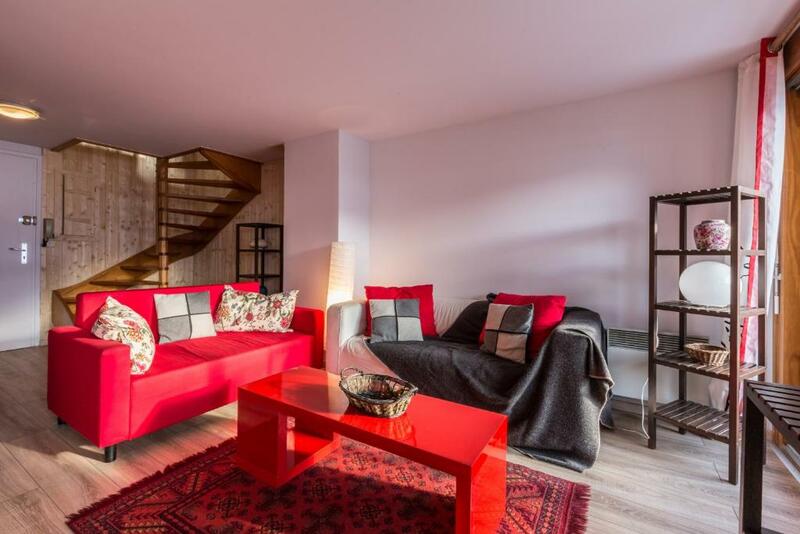 Both possess a classic French affinity for interior design, appreciate architecture and are contemporary property development aficionados in the Chamonix Valley. They are widely travelled and have lived abroad, as well as being experienced in running businesses in France. They understand the many different means required for effective property management. As fully registered French estate agents they can negotiate excellent property sales. House Rules Appartment Rubis Aiguille du Midi Chamonix Centre takes special requests – add in the next step! A EUR1400 damage deposit is required on arrival (around USD1574.09). This deposit will be fully refunded at check-out, as long as there isn't any damage to the property. Appartment Rubis Aiguille du Midi Chamonix Centre accepts these cards and reserves the right to temporarily hold an amount prior to arrival. If you plan on arriving after 20:00, please note that a EUR 30 extra fee will apply. A damage deposit of EUR 1400 is required on arrival. That's about 1574.09USD. This will be collected by credit card. You should be reimbursed on check-out. Your deposit will be refunded in full by credit card, subject to an inspection of the property. Please note that check-in and key collection take place at: at the property, Chamonix 74400. Please inform Appartment Rubis Aiguille du Midi Chamonix Centre of your expected arrival time in advance. You can use the Special Requests box when booking, or contact the property directly using the contact details in your confirmation. Sometimes a little noisy at night from the street. Upstairs shower is too low for an adult to use, but the bath is fine. Downstairs shower is quite tight also - but usable. Second bed in the twin room is under an angled ceiling so its quite hard to get in and out of without hitting your head. Some heaters were broken. No key for ski store. Small shower. No ice tray in fridge.